As Memorial Day passes, you’re probably thinking about how you want the rest of your summer to look. Between visits to the beach, traveling across the country or world, and maybe a music festival or two, you’re probably gearing up for a fun summer ahead. However, sometimes you just want to have a few days to yourself or with your partner to really enjoy a staycation. For those who are not privy to a staycation, it’s a way to really get away from the real world without leaving the place you live in. 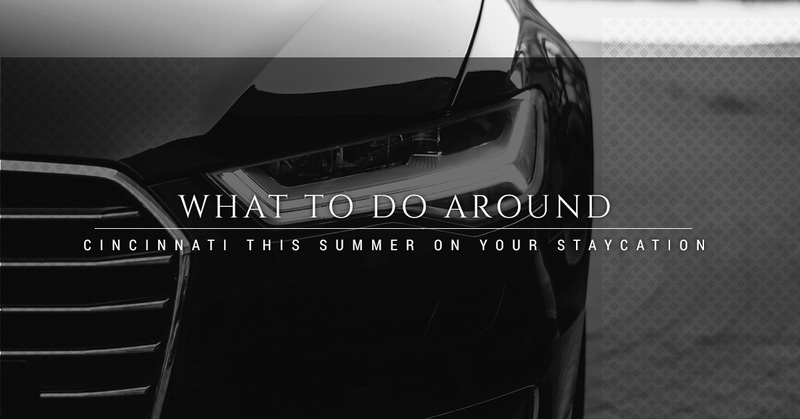 A great way to introduce a staycation into your summer plans is by checking out all of the things you can do around Cincinnati while utilizing our car services. Relax, take in the sights, and have as much fun as you want when you take advantage of our car services. Cincinnati is home to a myriad of museums that you’ve probably never checked out before. Many times, when you live in the same place for such a long time the little things can slip through the cracks. Those little things are generally museums. We picked out some of the favorite museums in the Cincinnati area. From educational to just plan enjoyable, these museums are great fun and with our car service, you don’t have to worry about parking. The art museum in Cincinnati is located on Eden Park Drive in a beautiful building. It’s free admission for the general exhibits, but the special ones can vary in price. The art that’s in the Cincinnati museum is from around the world and spanning 6,000 years. With over 67,000 pieces of art, you’ll find yourself spending most of the day looking at art and being driven around Cincinnati. Do you love vintage American signs? Well, you’re in luck! There’s a museum in the heart of Cincinnati where you can walk down memory lane to see half a century of American signs. You can learn about pre-neon signs in the early 1900s all the way to plastic ones in the 1950s. From guided tours to exploring on your own, you’ll love finding hidden gems at the American Sign Museum. If you’re a fan of history, then the National Underground Railroad Freedom Center is a great option. This monument is a symbol of the importance of freedom and how it’s a struggle to fight for basic human rights. When you visit this center, you’ll notice the historical significance and how the cornerstones of freedom are represented in the architecture. From adults to children, anyone will enjoy this establishment. If you want to have some fun in the afternoon, then check out some enjoyable tours. From checking out distillery tours to bourbon ones, you’ll get a kick out of the spirits that are in the area. Additionally, you don’t have to worry about driving home after you’ve tasted these beverages when you use our car service. The Bourbon And Spirits Distillery Tour is one of the up and coming events in Cincinnati. When you go on this tour, you’ll go through three distilleries and meet the masterminds behind these tours. Schedule a staycation in the city you reside in! Book Ohio Luxury Transport today!